You Can't Recycle a Heart? 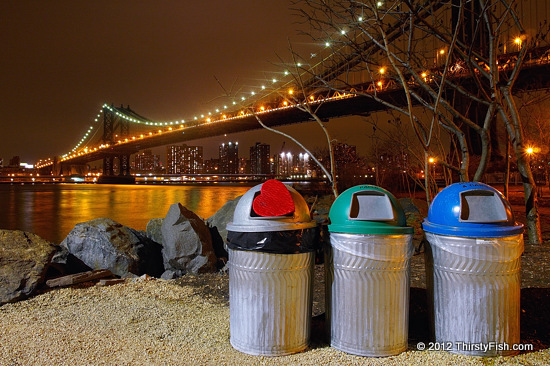 In New York City, recycling bins come in two colors; green for newspapers and magazines, and blue for bottles and cans. Well, on Valentine's Day last Tuesday, I stumbled upon this scene, walked backed to my car, picked up my camera and tripod, and took this shot. I guess you can't recycle a heart? In the 15th Century, lovers began to express their love for each other by sending greeting cards known as valentines. And, by the second half of twentieth century, Valentine's Day had became a hallmark holiday, promoted by the likes of floral, chocolate and diamond industries. Some criticize Valentine's Day as being too commercial, unimaginative, or even as an example of forced romance. Others view it as a sad reminder of their loneliness. Many nonchristians see it as cultural contamination from the West. In some countries, people are arrested for celebrating it. Despite all of that, Valentine's Day is steadily becoming a globally celebrated occasion.